6 routes offer local service to the University of Houston main campus. Connect via transit centers to a network of additional local and Park and Ride routes providing service across the Houston metro area. Eastwood Transit Center – Located at I-45/Lockwood, commuters using the Eastwood Transit Center can connect to the University of Houston via the Cougar Line tan route. Downtown Transit Center – Located at 1900 Main Street, between St. Joseph and Piece, many Park and Ride routes have stops within a few blocks of the Downtown Transit Center, providing convenient connections to the University of Houston main campus. Routes and Schedules for METRO service, including connecting routes. METRO also provides Park and Ride service, allowing commuters to drive to a nearby transit center and ride in from there. Available from most all Houston suburbs, Park and Ride service allows you to save gas and skip the frustration of rush hour traffic. Residents along the Gulf Freeway corridor can connect via the Eastwood Transit Center and ride the Cougar Line campus shuttle. All other areas will connect to local routes at the Downtown Transit Center. METRO Q-Cards are reloadable cards used to pay fares on METRO buses and METRORail. Students can register for a discounted student Q-Card via their parking account. Faculty/staff can obtain a Q-Card by visiting the Welcome Center or Stadium garage service desk. Q-Cards can be reloaded at the Welcome Center services desk using cash or credit card. Routes, schedules and an interactive trip planner are available at ridemetro.org. METRO's Purple Line provides frequent service between the University of Houston and downtown Houston. Riders can use their Q-Card and pay the same fare as local bus service with free transfers. 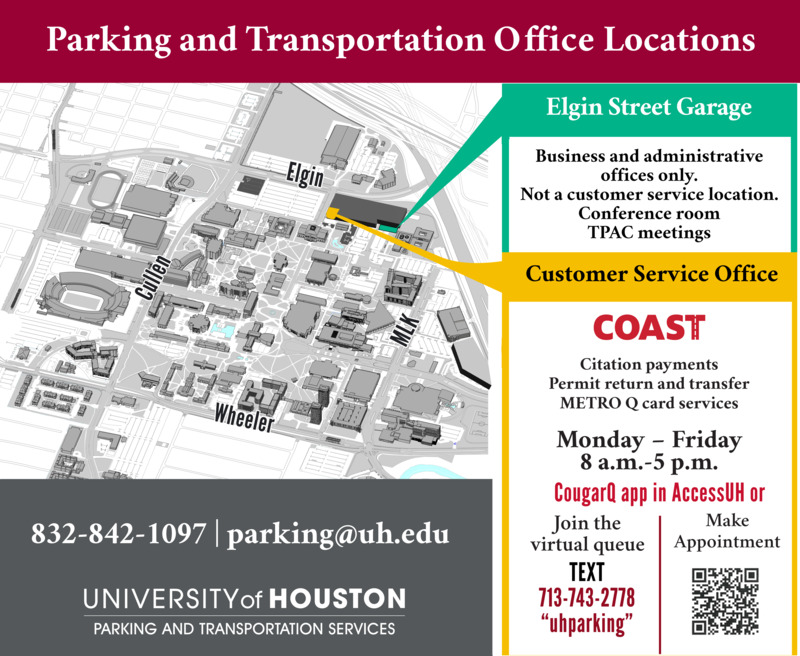 In an effort to better serve UH’s ever-growing campus and community, Parking and Transportation Services now offers eligible faculty, staff and students the opportunity to join COAST (Coogs on Alternative and Sustainable Transportation), a new incentive program for individuals who use alternative transportation to get to campus. Students receive $27.50 each month towards their METRO fare for joining, faculty / staff members receive 50% of their monthly METRO fare if using local bus and rail to commute, and faculty / staff members commuting on the METRO Park and Ride receive 25% of their monthly METRO fare.